Some teenagers are obsessed with bands (Is One Direction still a thing?) like I’m obsessed with breakfast. Not the breakfast I can make, though. I go through obsessions there, too. (I’m actually getting married to the Cranberry Pistachio bread from HEB, a beloved Texas grocery store, next week. “Kelley Pistachio” in less than 7 days!! WOOOOOOO!!!!!) I am talking about the fast food kind, though it pains my heart to call it “fast food”. It feels so disrespectful! For a while, it was the Egg McMuffin. Then it was the breakfast sandwich from Starbucks with the artisan bread, gouda, egg and bacon. Now, it’s the flatbread breakfast sandwich I have made at Subway. That flatbread, egg white, tomatoes, spinach, bell peppers and salt and pepper are sooooo good. So good. I usually get this flatbread from the Subway near my house. I know the Subway people there as well as some people know their cousins. There are three main ones that are always there. Day in and day out they bake that bread, chop those vegetables, make that tea and bake those cookies. Last year, I honestly thought I should get them all a little Christmas present. I may actually do it this year. After all the flatbread breakfast sandwiches I’ve eaten, I’ve become quite the pro at how Subway handles things at their various stores. “My” Subway, for example, has their sweet tea ready to go by 8:30 in the morning. If they don’t and they see me coming, they get to working on it. (I like to get a large cup of half sweetened and half unsweetened tea to take to work. Okay, it’s 3/4th’s sweet and 1/4th not. Sometimes 7/8th’s sweet, if I was taking a lie detector test.) One Subway I went to the other morning only had unsweetened tea ready by 8:30, which made me a tinge grumpy. Some Subways have the credit card reader available for you to swipe yourself, whereas “mine” doesn’t. I have to go through all of the hassle of handing the card over to the cashier like I’m Betty Rubble herself. If they weren’t so nice, I wouldn’t stand for it, I tell ya. “My” Subway always has a Sharpie nearby, too, which I love, because I often, often, often get the boys’ lunches there for school in the morning and it’s much easier to write down which sandwich belongs to which child before I leave the store. If my older son got the buffalo chicken sandwich and my younger son got the turkey sandwich, the earth may rip down the middle clear down to the core. Another reason why I love Subway for breakfast is because it is never that crowded. You people haven’t caught on yet. This means I can stand near the cash register and spread all my sandwich gear out. This is important because I need adequate space to assess my situation and ensure that son #1 doesn’t get his brother’s Cheetos bag (they make his fingers turn orange!!) and son #2 gets the oatmeal cookie and not chocolate chip. Some people actually have the nerve to come into the store when I am in there sorting my stuff out. I KNOW MY SUBWAY and I have this Subway thing down to a science. Just before running a zillion errands for my sister’s shower last weekend, I realized I was going to need some Subway fuel. I glanced in the mirror and realized, though, that I couldn’t go into Subway looking like that. That would be disrespecting the chain!! I had zero make-up on because I had just dropped off my 6-year-old at his baseball game. He had to be there by 7:25 IN THE MORNING. Besides the zero make-up thing, the sunlight shining on my face also told me I needed to pluck my eyebrows and wax my upper lip. This didn’t all have to be done before going to Subway, but I did want to take care of it before the baby shower happening in just a couple of hours. I couldn’t have my sister’s friends congratulate her on the baby and then ask why her brother came to the shower while nodding their heads toward me. So, I did my thing. I put on my make-up. I daydreamed about the flatbread. I was finally ready to go in and bring the flatbread home, but time was running out. I still had a thousand errands!! Thankfully, Subway is always on top of their game. They would whip me right on through that line. Subway artistry is something you really appreciate when new girls that come from Arkansas aren’t sure how to make the flatbread breakfast sandwiches. I was rushed for time. Girlfriend was going to have to move this along. “See? It won’t flop around. It’s still cold,” she said as shook it and held it up for me to see. Sister kept droning on about Arkansas and her less-than-stellar Subway skills when I heard a lady chirping nearby. Well, goodness gracious. Couldn’t she see I was about to scale the sandwich counter and put on my own plastic gloves? What ever did she need? Between you and me, it was no band-aid. I thought it was best I not mention that right then and there, though. Chirper and I had only met a few nanoseconds before. I hesitate to even tell you but, seeing as you have invested this much time into my story already, I will go ahead and share. It was my waxing strip. 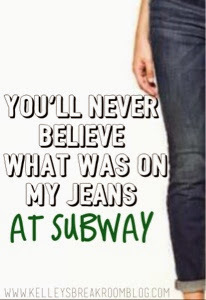 You see, this “band-aid” incident is really Subway’s fault. If the breakfast flatbreads weren’t so good, I would not have pulled into the parking lot so early in the morning. If I wouldn’t have pulled into the parking lot so early, I wouldn’t have been exposed to the early morning sunlight in such a way that I felt compelled to tidy up my face. Fingers crossed you weren’t in the middle of eating a Subway sandwich? Have you ever walked around with a waxing strip on your leg? Are you from Arkansas? Do you like breakfast? These are all things that we MUST discuss. Please CHIRP up!